I’m not sure where this pie originated from, or where it got its name, but I’ve had it at a few different places and I love it. I love it so much that I attempted to recreate it. This recipe will serve 4 people, you can make 4 individual pies, or one large one, when I made them I went for 2 big pies. There will be enough rough puff pastry for whatever you choose, probably extra if you make one big pie, if that’s the case, wrap the extra in cling film and chuck it in the freezer to use another time… or, stick some jam in it and bake a few homemade jam tarts. I served my pie hot with mash, roasted root veg, and green veggies… and of course lashings of gravy. But it is also fantastic cold (I know this because I had it for lunch the next day, a welcomed break from salad, might I add). If you don’t fancy making enough pie for 4 people, half / quarter the recipe… or, make them all and freeze what you don’t need, then just defrost the pies and warm through in the oven when you want them! 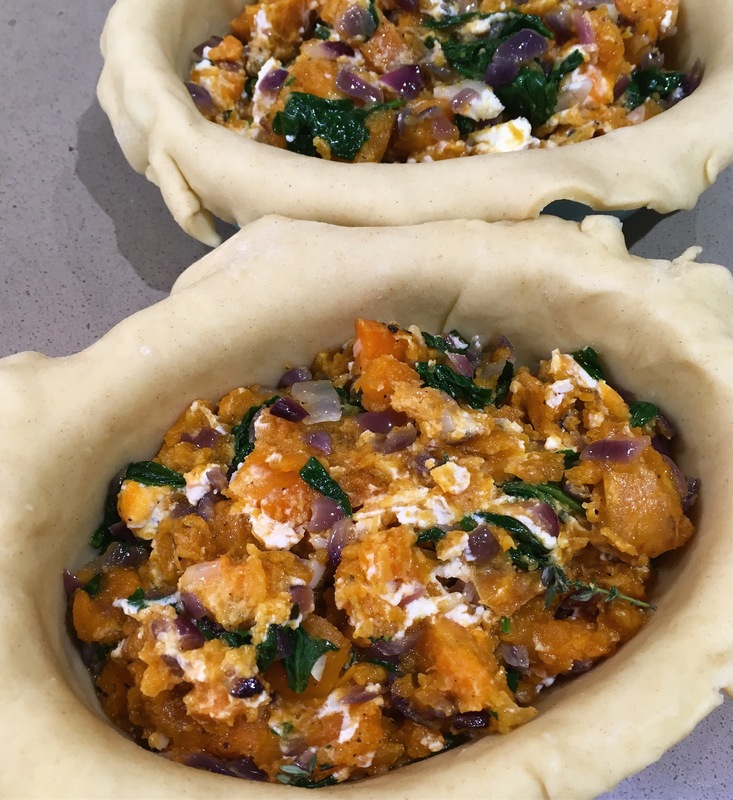 So here it is, my recipe for sweet potato, red onion, goats cheese and spinach “Heidi” pies. Properly filling winter hibernation food! Sift the flour into a large bowl, and add the salt. Mix into a dough, leaving large pieces of butter marbled through the dough, and being careful not to overwork, this should be a rough dough. After 20 minutes in the fridge, transfer the dough to a lightly floured, clean surface. Roll out the dough into a rough rectangle shape. Fold the dough into thirds, rotate by 90° and repeat twice. Re-wrap the dough and refrigerate for a further 20 minutes. Remove the dough from the fridge for the last time and do another fold, before rolling out and lining pastry tins. Dice the onion and sweet potato, and finely slice the garlic. Roast for approximately 45 minutes. When roasted, remove from the oven, crush the potatoes roughly with a fork. Crumble the goats cheese and stir through the hot mixture. Blanch the spinach, and drain before adding to the mixture. Bake for approximately 30 minutes, or until golden brown. This looks delicious and I am definitely going to try it. For the pie crust you say 1 very cold water…but you don’t say how much. Could you please let me know? I’m dying to try out this recipe! Thanks!